You are currently browsing the Suburban Homesteading – Frugal Living blog archives for August, 2015. I came home this evening after a long day at work and a late lunch, not really feeling like a full blown dinner. But, I knew I had to eat something…to sustain me through the second half of my day – the farm half. After changing into work clothes, feeding and watering the chickens, collecting eggs and bedding everyone down for the night, the outside world had turned tar black. I headed back into the house to figure out dinner. Once I opened the fridge the meal came together rather easily. I had an Asian pear from one of the espaliered trees planted earlier this year, goat’s milk I had gotten from my friend Sandy, a few left over herbs from a previous ambitious dinner menu, and a loaf of 5-minute rustic bread I had made the night before. Warm weather is still with us and you don’t want to be short of lemonade. Save yourself time and money by making a batch of lemonade concentrate. Freeze in 1-cup containers and you’ll never run out of the tangy sweet stuff that’s so refreshing on a hot late summer day. 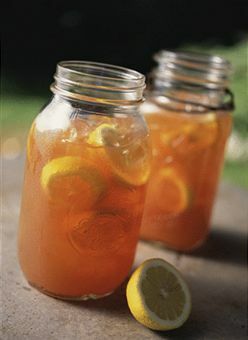 Check out our Lemonade for 100 recipe in the Mason Jar Lemonade and Iced Tea post. It’s difficult for tender young plants to withstand cold night temperatures. 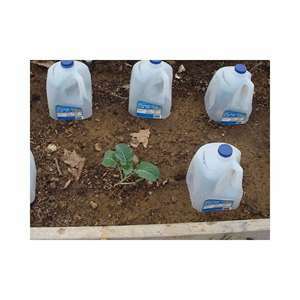 To keep them toasty warm and able to grow strong, cover them with an empty 1-gallon milk or water jugs. These inexpensive homemade cloches or mini greenhouses are great for shielding young plants from chilly nighttime temps or giving germinating seeds the warmth they need. Plus it will save you money for MORE SEEDS! because cloches are expensive. Simply rinse the jug thoroughly, cut the bottom off and place over the seedling or germinating seed. When I was a little girl and our town had not yet experienced the rapid building and influx of people of its later years, we had small neighborhood markets. The kind you still see in some larger cities or European countries. Think the Butcher, or the Baker, but no Candlestick Maker. We had small grocery stores and five & dime shops that were breeming with all kinds of curiosities – from hardware to gardening to sewing supplies, all displayed in one shop. My favorite was the butcher shop; a long narrow store with a meat counter on one side and all kinds of meat accompaniments on the other. Behind the counter were stainless steel tables for slicing and wrapping meat. There was a large band saw for cutting carcasses into quarters or large roasts. Saws and hooks and other tools hung from the “C” shaped track that brought whole carcasses from the cooler to the cutting tables. The walk-in freezer sat at the end of the room, adorned with posters from the Lamb Council, the Pork Producers Association and the American Beef Council. In the fall, the shop owner would put a large poster on the freezer door announcing the time to order special holiday meats like fresh turkeys, hams, ducks, geese and prime rib or tenderloins. Each week my mom would take us with her as she did her weekly meat shopping. The butcher would talk to her about what was on special, what had come in that day and what would be good choices to feed a family of five on a budget. But, without fail we left with the same thing every week – chicken, ham, homemade sausage, ground beef, stew meat and something dad could grill on the BBQ during the weekend. The butcher would wrap each cut of meat in pink paper and secure it with white butcher tape. There were no plastic bags or carts, just an arm load of meat to feed a hungry family. Before leaving, the butcher would hand us two bones as treats for our dogs, a large one for Sam our Great Dane and a smaller one for Shelly, moms Cocker Spaniel. Starting off with chickens, but don’t want to spend the money to make nesting boxes? Not to worry. Empty cat litter buckets make the perfect little home for hens who like the comfort and security of enclosed spaces. Just wash the bucket with warm soapy water before attaching to the coop wall. Be sure to save the lid as well. Cut and attach it to the bucket to keep in all the nesting material. There you have it. Money saved. Hens happy. And, one less plastic going into the landfill. This article was written a few years ago, but still remains one of our most popular, so I decided to bring it back to the top of the line-up. Second to chickens, I have always thought that rabbits made the perfect homestead livestock. They are quiet, easy to raise and don’t take up too much space. Plus, they are a great food source and provide the gardens with mounds of excellent fertilizer. With just one breeding trio – two does (female) and one buck (male) – I can raise more than enough meat to feed my family for a full year. And the best part – it’s all done on an 8’ section of our barn wall. But, before we get too far, as I always say when talking about raising any meat animal the biggest question to ask yourself is “Can You Do The Deed?” meaning, can you butcher your own animals or have them butchered by someone else. If you can, then in just a few months you will be well on your way to raising your own supply of healthy, drug free, humanely processed meat for the freezer. Spice mixes like grill seasonings and rib rubs might seem like a good buy because they contain a lot of spices you would have to buy individually, but check the label first before you buy. Predictably the first ingredient you will see is salt followed by a few vague ‘herbs and spices’, then a raft of preservatives and artificial stuff. You’ll probably be surprised to discover how many herbs you already have in your pantry. Many cookbooks include recipes for mixes, and of course there is always the internet. The best thing about making your own, aside from saving a fortune, is that you can customize each mix to fit your own tastes. To get you started, check out our Mix It Up post for a short collection of make-your-own-mixes. The Fair. The Concert. The Meteor Shower. What a Night! The sights, the sounds, the smells; catching up with old friends, always brings back fond memories of my days showing at the county fair, and of being a “show mom” to DD. The concert was huge, bigger than anyone ever imagined. 500 extra people crammed into the arena. It was one big crazy party with thousands of friends you never knew you had. Dark, dark night. Crystal clear sky. Stars that shine. Warm summer breeze floating in from the sea. Streaks of light across a velvet canvass. Mother nature in her awesomeness. What a night. So tired. I’ll be trashed at work today, but life is always worth a sleepless night. If you missed the meteor display there are more to come. Pick a night, grab a blanket and turn your eyes to the heavens. You won’t be sorry you did. Trust me. Food. Rides. Displays. Competitions. Rodeos. Awards. Animals. Fun by the Sea. Our county fair is already a few days old, but the excitement just keeps building. Yesterday’s market lamb show saw one of DD’s protégées winning the coveted Grand Champion award and a former pupil winning Reserve Grand. Bravo! to Sam and Elizabeth for a job well done and an award hard fought won. Makes me nostalgic for those days of old when DD was front and center in the show barn. Livestock is in our blood…forever. But, we’ll be there tonight for The Band Perry concert. Do you have a favorite contest at your county fair?